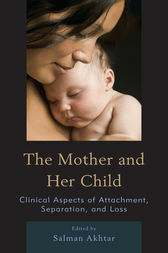 The Mother and Her Child: Clinical Aspects of Attachment, Separation, and Loss, edited by Salman Akhtar, focuses upon the formation of an individual's self in the crucible of the early mother-child relationship. Bringing together contributions from distinguished psychoanalysts and child observational researchers, it elucidates the nuances of mothering, the child's tie to the mother, the mysteries of secure attachment, and the hazards of insecure attachment. These experts also discuss issues of separation, loss, and alternate sources of love when the mother is absent or emotionally unavailable, while highlighting the relevance of such ideas to the treatment of children and adults. Salman Akhtar, MD, is professor of psychiatry at Jefferson Medical College and training and supervising analyst at the Psychoanalytic Center of Philadelphia.